Often as we journey through the Bible we run across more unfamiliar passages than we would like to admit. Why is this story here? How is this passage relevant to the story of salvation? Or maybe we have this attitude towards entire books. What purpose does Lamentations, or even Isaiah, serve? Even many older Christians haven’t given this much thought, though we may be good at finding our favourite books, chapters, or verses. 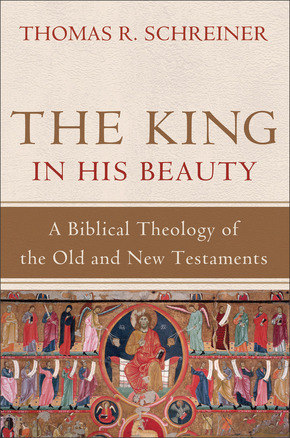 Putting the whole Bible together to see where everything fits is both exciting and daunting so we often need help in understanding the story and flow, and this brings me to Thomas Schreiner’s The King in His Beauty: A Biblical Theology of the Old and New Testaments. For Schreiner, “Scripture unfolds the story of the kingdom, and God’s glory is the reason for the story.” (xiii, emphasis italicized in original). Schreiner uses the kingdom as a motif throughout this book, seeing a threefold focus of God’s rule, our role within His kingdom, and creation as the place where His kingship is worked out (xv). Schreiner desires that this will be a book that is “understandable for college students, laypersons, seminary students, and pastors” (x). This is a book for you! The King in His Beauty is not so much a verse-by-verse commentary, neither is it a survey of the Bible. Rather, it is a Biblical Theology; meaning that Schreiner traces the message and themes of the Bible throughout. This is exactly what many of us need: help in seeing the forest to better understand the trees. Schreiner tends to work through each book, though some are packaged together (e.g. the Twelve, and Paul’s Letters). Some books are approached from beginning to end (e.g. Genesis), while others are summarized thematically (e.g. Isaiah). Switching between both narratival and thematic approaches has both pros and cons. Positively, it allows the content to be presented as it best lends itself to and prevents redundancy and repetition. However, if one reads this book alongside their Bible reading (which I recommend, see below), the thematic sections may not be as beneficial. One may ask why Schreiner produced this book, considering he has released both a New Testament Theology and a Pauline Theology in the past. Does this book make the others redundant, or do those books make the NT material in this book unnecessary? ‘No’ to both questions. Firstly, the other two books are entirely thematic and less naturally readable from cover to cover. Secondly, and more importantly, I would consider this as the most clear and simplified of Schreiner’s work. Where the Pauline Theology and NT Theology are both more academic – and intended to be so – The King in His Beauty is far more approachable for anyone. The content itself is outstanding. I can’t overstate enough just how beneficial this book would be for any Christian. Allow me to give a few reasons why. Schreiner is a very clear writer that somehow is able to present difficult theology and insights in a surprisingly approachable manner. Simple moralizing are avoided and the redemptive storyline of Scripture is emphasized. For example, Schreiner shows that the book of Judges isn’t only full of negative and positive examples for us, but the book continually points us forward to Christ. Schreiner is unafraid of interpreting Scripture by Scripture, which is unfortunately sometimes unpopular in scholarship. Important (but commonly missed) themes are continually highlighted so that the reader can see how God’s redemptive story is unfolding. Many of the chapters are particularly excellent. To only mention one, I thoroughly enjoyed Schreiner’s comments on the Psalms. Schreiner had great insights on the five-fold structure of the book, how individual Psalms relate to each other, and how they point us to Christ. It was clear that he had meditated on the Psalms and had much to say here. Schreiner is a pastor-scholar and I’ve only heard the best things about his character (“I find it so hard to say anything that can be even remotely negative about Schreiner and his work, since he is the godliest scholar I have ever met.” Here, and here). There was, however, one weakness that should be mentioned. As having read a few works of Biblical Theology (BT) before, much of The King in His Beauty simply re-tread similar ground and didn’t necessarily bring new insights to the table. At times the best points were simply quotations of other influential BTs. Schreiner also appeared to lean quite heavily on certain books and scholars such as Childs, Dempster, Von Rad, and a few from the NSBT series. This was particularly the case in the Old Testament, which is not too surprising since Schreiner is a NT expert. This is more serious if one has read other BT books, but if the reader is new to the field and wants a great summary of the best scholarship in much more readable prose, then this weakness becomes a strength. The King in His Beauty is a wonderful book that should be read widely. I would hope that the lay Christian is not put off by the size of the book, nor the mention of theology in the subtitle. This book is for all Christians. Pastors and teachers, likewise should not neglect this book simply due to its approachability. There is much meat to chew on here. Schreiner has managed to provide a book that has something for everyone. Of course, with the subject matter being the entire Bible, one may not agree with every conclusion but that is unavoidable and expected. I would be delighted if a Christian read a section of this book alongside their daily Bible reading. I did it this year as I read large chunks of the Bible in one sitting and it was very profitable. Pastors and teachers could also read a chapter (often 20-30 pages each) before they teach on a book. A Christian who is unfamiliar with certain books could just cherry-pick chapters and would gain much from this. Buy The King in His Beauty!